Section 201.08(1) does not prohibit enforcement of a n unsecured promissory note in a court of this state for nonpayment of the documentary stamp tax. The string of cases applying a prohibition against enforcement of promissory notes appear to misread the statute. This statute is clear. It contains no prohibition against enforcement for failure to pay the tax on a promissory note, other than one securing future advances. The legislature might wish to amend the statute, as it is apparent that failure to pay the documentary tax on a promissory note is not an infrequent occurrence, and prohibiting enforcement of the note until such tax is paid would enhance collection efforts. The United States Supreme Court granted certiorari in ten cases today. You can read about it at the SCOTUS Blog and see the order list below. In Oken et. al. v. Williams (1D08-3398), the First District granted certiorari because the "trial court departed from the essential requirements of law in denying petitioners’ (defendants, Keith Robert Oken, M.D., and Mayo Clinic of Florida) motion to dismiss respondent’s (plaintiff, Ted Williams) malpractice action for failing to timely comply with the statutory presuit requirements by failing to attach a corroborating affidavit of a “medical expert” as defined by section 766.202(6), Florida Statutes." The court also has an extremely interesting discussion about whether it is appropriate for judges (in this case the judge writing the appellate opinion) to consult internet sources not cited by a party. In this case, petitioner Oken, “the health care provider against whom . . . the testimony is offered,” is a board certified cardiologist. There is no dispute that respondent’s expert does not specialize in cardiology. Thus, to corroborate respondent’s claim under section 766.102(5)(a)(1), Florida Statutes, respondent’s expert must specialize “in a similar specialty that includes the evaluation, diagnosis, or treatment of the medical condition that is the subject of the claim and have prior experience treating similar patients.”...Florida courts have consistently affirmed the importance of an appropriate verified medical expert opinion as a prerequisite to file suit for medical malpractice." As to the internet research, the majority stated in a footnote that covers three pages: "No one can argue that indiscriminate, independent internet research by a judge involving subjective facts, non-legal opinions and studies, or the use of unknown or unverified websites not presented by the parties would create significant concerns. The use of generally-known knowledge, however, which is capable of accurate and ready determination from sources whose accuracy cannot reasonably be questioned, does not present the same concerns." Because the majority opinion transgresses binding precedent of this Court and ignores persuasive non-binding, out-of-state precedent by relying on Internet information not contained in the case record and unknown to the parties; fails to follow relevant procedural precedent of substantial persuasive value; and injects the judiciary into adversarial territory heretofore untraveled, I am compelled to dissent. In Florida Insurance Guaranty Association v. Castillo (4D09-103), the Fourth District reversed the trial court's order denying FIGA's motion to compel appraisal. After the Castillo's carrier, Florida Preferred Property Insurance Company, was declared insolvent, the insured filed a new claim with FIGA. FIGA denied the claim and the Castillo's filed suit. After the lawsuit was filed, FIGA filed a motion to dismiss again denying the claim and also arguing the Castillo's failed to comply with its post loss obligations including participating in an appraisal. Two months after the complaint was filed, FIGA determined that the patio damage was a covered loss and told the Castillas that it would formally withdraw its previous denial of the claim. FIGA filed an amended motion to dismiss or abate the action, referencing its withdrawal of the claim denial and rearguing that the Castillas failed to satisfy all conditions precedent, including the appraisal process. FIGA requested that the Castillas provide documentation to substantiate their claim and requested that they submit to an examination under oath. The trial court denied the motion to dismiss or abate, ordering FIGA to answer the complaint. In its answer, FIGA raised as a n affirmative defense its right to appraisal pursuant to the terms and conditions of the insurance policy contract...FIGA then filed a motion to compel appraisal pursuant to the insurance policy. FIGA contended that its denial of the claim did not constitute a waiver of its right to appraisal. The policy in question contained a clause requiring an appraisal of the amount of any claimed loss. FIGA asserted the right to an appraisal in its original motion to dismiss and in all subsequent pleadings and at hearings. It never waived its right to an appraisal. An appraisal clause may be invoked for the first time after litigation has commenced. Similarly, in this case FIGA has never acted inconsistently with its right to an appraisal, having raised that right at the earliest opportunity in this suit and continued to claim it through its subsequent pleadings. Asserting that the insured meet all other conditions precedent to claiming a loss is not inconsistent with demanding a n appraisal. Claiming that the loss is not covered is also not inconsistent with a demand for an appraisal. See Gonzalez. That the court compelled FIGA to answer and give discovery is not the voluntary participation in the lawsuit which would constitute a waiver of the insureds’ rights. Because the insurance contract provided the appraisal process, which agreement is not in doubt, and FIGA did not waive its right to an appraisal by participating in the lawsuit, the trial court erred in denying FIGA’s motion to compel the appraisal. The N.Y. Times has an editorial titled "High Cost of Death Row." The article includes the following: "According to the organization, keeping inmates on death row in Florida costs taxpayers $51 million a year more than holding them for life without parole." You can also see the article in Google fast flip here. In Tropical Jewelers, Inc. v. Bank of America, N.A. (3D08-164), the Third District affirmed the trial court's conclusion that the bank "had disposed of the collateral in a commercially unreasonable fashion." This is not the first time the case has been up on appeal. After summary judgment was entered in favor of the Bank in 1998 for a deficiency judgment, Tropical appealed in Tropical Jewelers, Inc. v. NationsBank, N.A., 781 So. 2d 381 (Fla. 3d DCA 2000) (“Tropical I”). The case was reheard, en banc, in Tropical Jewelers, Inc. v. NationsBank, N.A., 781 So. 2d 392 (Fla. 3d DCA 2000) (“Tropical II”). The summary judgment was reversed because there existed a genuine issue of material fact as to whether the collateral was disposed of in a commercially reasonable fashion and the case was remanded. The case eventually proceeded to a bench trial and the trial court found that the Bank had disposed of the collateral in a commercially unreasonable fashion and was not entitled to a deficiency judgment. The trial court also found that the appellants failed to prove any resulting damages. Pursuant to section 679.507 (2), Florida Statutes (1995)2, if a “secured party either sells the collateral in the usual manner in any recognized market at the time of his sale or if he has otherwise sold in conformity with reasonable commercial practices among dealers in the type of property sold, he has sold in a commercially reasonable manner.” Given that the Bank apparently did not sell all of the collateral at its disposal, including the unaccounted-for faceting machines, and the trial court’s findings regarding the limitations in both Stampler Auctions’ experience with liquidation of jewelry and its advertising of the auctions, we find no error in the trial court’s determination that Bank had disposed of the collateral in a commercially unreasonable fashion. 2 This statute has been renumbered and is now section 679.627, Florida Statutes (2009). The SCOTUS Blog has added Florida Association of Professional Lobbyists, Inc. et al. v. Division of Legislative Information Services of the Florida Office of Legislative Services et al. to its "Petition to Watch List." The case was previously discussed on this blog here. The issue before the Supreme Court, from the SCOTUS Blog, is below. Issue: Whether a state law that requires disclosure of the identities of those paying for grassroots lobbying – “opinion articles, issue advertisements, and letter writing campaigns” – facially violates the First and Fourteenth Amendments due to vagueness and overbreadth.Whether a state law that prohibits all gifts for the purpose of lobbying facially violates the First and Fourteenth Amendments due to vagueness and overbreadth. A “judge of the United States shall disqualify himself in any proceeding in which his impartiality might reasonably be questioned.” 28 U.S.C. § 455(a). Generally, only personal bias stemming from extrajudicial sources is sufficient to disqualify a judge...An exception exists for judicial conduct demonstrating “such pervasive bias and prejudice that it constitutes bias against a party,” but neither “rulings adverse to a party, nor friction between the court and counsel constitute[s] pervasive bias.”...On the contrary, “the standard is whether an objective, fully informed lay observer would entertain significant doubt about the judge’s impartiality.”...Rulings against one party in favor of another, without more, do not require a judge to disqualify himself. Smith’s argument that the district court should not have awarded fees for time expended by the associate because he had not yet entered an appearance is similarly unavailing. Neither the Federal Rules of Civil Procedure nor the district court’s Local Rules require every attorney working on a case to enter an appearance before the court. With respect to Smith’s contention that the imposition of sanctions required a finding of bad faith, Rule 37 fee awards, unlike sanctions imposed pursuant to the court’s inherent powers, do not require such a finding. In Rance v. Rocksolid Granit USA, Inc. (09-11026), the Eleventh Circuit addressed an issue of first impression in the Circuit and reversed the district cout's dismissal of the plaintiffs lawsuit because the "district court clerk and the U.S. Marshal failed to prepare the summons and complaint and serve Rocksolid, as expressly directed by the district court and required by law." The court noted "We have not yet articulated the proper standard of review for a sua sponte dismissal pursuant to Federal Rule of Civil Procedure 4(m). 'However, we review for abuse of discretion a court’s dismissal without prejudice of a plaintiff’s complaint for failure to timely serve a defendant under Rule 4(m)'...Accordingly, an abuse of discretion is the proper standard of review here as well." Our sister circuits have held that a plaintiff has shown “good cause” for purposes of a dismissal pursuant to Rule 4(m) when a United States Marshal has failed to properly serve process through no fault of the plaintiff...We agree with the well-reasoned decisions of our sister circuits. Relying on Fowler, we hold that the failure of the United States Marshal to effectuate service on behalf of an in forma pauperis plaintiff through no fault of that plaintiff constitutes “good cause” for the plaintiff’s failure to effect timely service within the meaning of Rule 4(m). In Raphael v. Shecter (4D08-432), the Fourth District reviewed "whether a statute that limits the non-economic damages of a plaintiff can be applied retroactively." This case was previously discussed in this post. The lawsuit related to the alleged failure by a doctor to timely administer anti-clotting drugs. Section 766.118, which placed limits on non-economic damages in medical malpractice cases, was adopted after the incident of malpractice in this case occurred. The notice of intent to initiate litigation was sent and the suit was filed in 2005, nearly two years after this statute became effective on September 15, 2003. When it adopted section 766.118(4), the Florida Legislature expressly stated the following intent to apply the statute retroactively to incidents that took place prior to its enactment...However, the Legislature’s clear intent to modify and allow new damages retroactively is not necessarily dispositive. Although a substantive statute will not operate retrospectively, the general rule is that a procedural or remedial statute may operate retrospectively...Substantive law prescribes “duties and rights” and procedural law amendments concern “means and methods. "...“The establishment or elimination of such a claim is clearly a substantive, rather than procedural, decision of the legislature because such a decision does, in fact, grant or eliminate a right or entitlement.” Id. at 1358. The limitation of non-economic damages in this case is no less a substantive decision than a limitation on punitive damages as demonstrated in Mancusi....In this case, the incident of medical malpractice occurred on April 10, 2003, and the claimant did not file an action for damages until after the new legislation substantively affecting this cause of action became effective, on September 15, 2003. Here, as in Mancusi, the new statute may not be retroactively applied to the cause of action which accrued previously. Id at 28. Section 776.118(4), Florida Statutes, cannot be retroactively enforced to impair the appellant’s vested rights. We find that the retroactive application of section 766.118(4) does not pass the test set out in Chase Federal and Old Port Cove, because it is an impairment of the substantive and vested rights of the appellant for the cause of action which accrued and vested on April 10, 2003. Disclaimer: George N. Meros and GrayRobinson, P.A. filed an amicus brief in this appeal. In Pro-Med Clinical Systems, L.L.C. v. Utopia Provider Systems, Inc. (4D09-2698), the Fourth District denied the petition for writ of prohibition concluding the action was not governed exclusively by federal copyright laws. The plaintiff filed two suits, one in state court and one in federal court, relating to "a product called ED Maximus, a system of templates, or charts, for use by emergency room physicians...The federal district court then issued an order granting Pro-Med summary judgment and holding that the ED Maximus system was not subject to federal copyright protection. Utopia Provider Sys., Inc. v. Pro-Med Clinical Sys., L.L.C., No. 07-60654-CIV., 2009 WL 248376 (S.D. Fla. Feb. 2, 2009)...In so holding, the court reasoned that the ED Maximus system of templates for recording patient information was not an original work of authorship or a compilation of data to which federal copyright protection extends." The court noted that "A writ of prohibition is a proper remedy to prevent a trial court from asserting subject-matter jurisdiction over matters within the exclusive jurisdiction of the federal courts...Am. Maritime Officers Union v. Merriken, 981 So. 2d 544, 547 (Fla. 4th DCA 2008) (granting petition for writ of prohibition relating to claim, which was preempted by federal law)." Pro-Med seems to contend that Utopia’s claim falls within the scope of the Copyright Act and that the materials are copyrightable. Of course, Pro-Med asserted a contrary position in the federal litigation where it successfully argued that the ED Maximus materials were not copyrightable. The federal district court has already determined that federal copyright protection does extend to the materials at issue and that the claims in question are properly brought in state court. Utopia’s claim for damages from the breach of the licensing agreement does not apply to a work that falls within the subject matter of the Copyright Act. The trial court in this case is not poised to adjudicate a claim of copyright infringement. In Selepro, Inc. v. Church, et al (4D08-2256), the Fourth District reversed the trial court and held "a dissolved foreign corporation can continue to maintain an action in Florida as part of 'winding up' its business." The plaintiff argues that section 607.1421, Florida Statutes (2008), authorizes a corporation that is administratively dissolved to wind up its affairs by maintaining a court action. The defendants respond that sections 607.1501 and 607.1502 prevent a foreign corporation without a certificate of authority from maintaining a proceeding in Florida until the certificate of authority is obtained. We agree with the plaintiff. In conclusion, the plaintiff filed suit when it was in good standing in Florida. The suit alleged claims of misappropriation, diversion of corporate assets, conversion, fraud, breach of contract, and tortious interference with a business opportunity. When the defendants filed their motion for summary judgment, the plaintiff had been administratively dissolved in Florida and was no longer an active corporation in Delaware. However, it was not transacting business, but instead winding up its affairs by amassing assets for final distribution though th e prosecution of the underlying suit. Accordingly, the corporation should be permitted to maintain the proceeding solely to wind up its affairs, pursuant to section 607.1421(3), Florida Statutes. WHEN A DEFENDANT IS TO BE RESENTENCED AFTER THE TRIAL COURT REVOKES HIS OR HER PROBATION AND PRIOR TO THAT REVOCATION THE TRIAL COURT'S JURISDICTION OVER ONE OR MORE OF THE ORIGINALLY SENTENCED OFFENSES HAS EXPIRED, SHOULD THESE OFFENSES OVER WHICH THE TRIAL COURT NO LONGER HAS JURISDICTION BE SCORED AS PRIOR RECORD ON A RECALCULATED SCORESHEET OR SHOULD THE TRIAL COURT EMPLOY THE ORIGINAL SCORESHEET ON WHICH THOSE OFFENSES REMAIN SCORED AS ADDITIONAL OFFENSES? In Mitchell v. The Beach Club of Hallandale Association, Inc. (4D08-2123 and 4D09-1903), the Fourth District reversed the trial court's dismissal. The trial court dismissed a complaint seeking an injunction without prejudice to be refiled if it satisfied the jurisdictional threshold for the circuit court. The trial court also awarded the association attorneys fees as the prevailing party. County and circuit courts have concurrent jurisdiction over equitable matters, including those requesting injunctive relief, regardless of the amount in controversy. See Baldwin Sod Farms, Inc. v. Corrigan, 746 So. 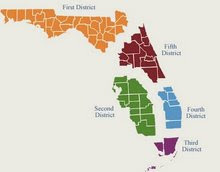 2d 1198, 1202 (Fla. 4th DCA 1999) (“county courts and circuit courts have concurrent jurisdiction over matters in equity, including injunctions”). Under section 34.01(4), Florida Statutes, county courts “may” hear matters in equity involving sums within the jurisdictional amount of the county court. Thus, county court jurisdiction is not exclusive. The court erred in applying the monetary jurisdictional limit to dismiss this complaint for lack of jurisdiction. We also reverse the award of prevailing party attorney’s fees. Not only is this necessary because of our reversal of the order dismissing, the Association did not “prevail” where the complaint was dismissed on jurisdictional grounds without prejudice to refile. See Shaw v. Schlusemeyer, 683 So. 2d 1187 (Fla. 5th DCA 1996). The First District has ordered oral argument for September 25, 2009 in the high profile case of National Collegiate Athletic Association v. The Associated Press; Cape etc., et al. (1D09-4385). The panel is comprised of JUDGES Webster, Padovano, and Clark. The court has a live stream of oral arguments here, however, they note the limited connections available. The NCAA's Initial Brief can be found here. The NCAA's Appendix can be found here. The Associated Press' Answer Brief can be found here. The Associated Press' Motion for Attorneys Fees can be found here. In Rappaport v. Mercantile Bank (2D09-609), the Second District granted a petition for certiorari and quashed the trial court's order that "improperly authorized Mercantile Bank (the Bank) to obtain personal financial information and documents from a nonparty that are unrelated to any claim or defense in the pending action and that have not been shown to be reasonably calculated to lead to the discovery of admissible evidence." The bank loaned $2,438,000 to Clearwater City Homes which Mr. Rappaport guaranteed. Mrs. Rappaport did not guarantee the loan. In October 2008, the bank sued Mr. Rappaport and Clearwater City Homes. The noticed Mrs. Rappaport for deposition and the two defendants filed a motion for "protective order concerning the proposed deposition of Mrs. Rappaport, noting that she 'is not a party to the transaction or involved in the loan at issue in any respect.' CCH and Mr. Rappaport objected to the taking of Mrs. Rappaport's deposition on the ground that 'she does not maintain any information that is reasonably calculated to lead to the discovery of admissible evidence'." The trial court denied the motion for protective order. "[P]ersonal finances are among those private matters kept secret by most people." Woodward v. Berkery, 714 So. 2d 1027, 1035 (Fla. 4th DCA 1998) (citing Winfield v. Div. of Pari-Mutuel Wagering, 477 So. 2d 544 (Fla. 1985)). The right of privacy set forth in article 1, section 23, of the Florida Constitution "undoubtedly expresses a policy that compelled disclosure through discovery be limited to that which is necessary for a court to determine contested issues." Id. at 1036. It follows "that the disclosure of personal financial information may cause irreparable harm to a person forced to disclose it, in a case in which the information is not relevant." Although the discovery of Mrs. Rappaport's personal financial information might be relevant to a fraudulent transfer claim, the Bank has not made such a claim against Mrs. Rappaport in any pleading. The circuit court's order improperly allowed the Bank to "piggyback" the discovery that might be appropriate to a claim under the UFTA onto their contractual claims against CCH and Mr. Rappaport. The circuit court's order departs from the essential requirements of law because the order requires Mrs. Rappaport, a nonparty, to disclose personal financial information that is neither relevant to the Bank's claims nor reasonably calculated to lead to the discovery of admissible evidence. To the extent that the circuit court's order requires Mrs. Rappaport to disclose her personal financial information, it undeniably violates her right to privacy. The disclosure of Mrs. Rappaport's personal financial information may cause irreparable harm which cannot be remedied on appeal. Accordingly, we quash the circuit court's order to the extent that it requires Mrs. Rappaport to provide information about her personal finances and to produce her personal financial records. A couple of months ago, Google revealed its Google Voice application. Brian Malcom at the Young Lawyers Blog wrote about the Google Voice service and described the features as: "The idea is simple: one phone number for all your calls and SMS. The Google Voice number will ring your home, work and cell phones separately or collectively, depending on the user's election at the time of setup." After the application was released, Google announced that Apple had rejected the application from the iPhone store [see here]. The Federal Communications, unsolicited, sent Google, Apple and AT&T asking about the rejection. The FCC letters can be found here. Until Friday, Google had only released redacted portions of their response. However, Apple continually stated the Google Voice application was still under review and recently released its response to the FCC. [The Apple response can be found here]. Based upon Apple's decision, and as discussed on Google's Public Policy Blog, Google decided to release its entire response to the FCC. Google's response can be found on the FCC's website here. In light of Apple's statement Friday that "We do not agree with all of the statements made by Google in their FCC letter. Apple has not rejected the Google Voice application and we continue to discuss it with Google," if the FCC continues to investigate the issue it looks like Google and Apple's lawyers will be working some overtime. Today, the D.C. Circuit overturned campaign finance rules enacted by the Federal Election Commission in 2005. The decision in Emily's List v. Federal Election Commission (08-5422) can be found here. The Associated Press stated: "Independent advocacy groups will be able to spend more money to try to influence federal elections under a decision Friday from a federal appeals court that overturned rules limiting nonprofits' campaign spending." Former Florida Supreme Court Justice Raoul G. Cantero, III, who joined White & Case's Miami office on October 1, 2008, co-authored an editorial titled "Florida death penalty statute needs reform." [Presumably, the piece was written apart from his current employment as the article provided his personal email address and simply stated he returned to private practice in Miami.] The article was co-authored by Mark R. Schlakman. The article coincided with an event being held at Florida State -- "The Florida State University Center for the Advancement of Human Rights will host an ABA-sponsored forum on the Florida Death Penalty, noon-3 p.m. today at the FSU College of Law Rotunda. The event is free. To watch it live or delayed, go to: http://campus.fsu.edu/ABA." Likely a coincidence, but the current Justice's of the Florida Supreme Court unanimously vacated a death sentence today - see here. It also comes the same week Ohio struggled for two hours and had to stop its efforts to execute a man [see here] and when the world is writing about a Texas Commission's report that evidence used to execute a man was not reliable [see here]. Other cases and news on this blog referencing the death penalty can be found here. How Appealing has a story about prosectors in the government's case against Barry Bonds. He also links to the audio of the oral argument, which the ninth circuit released today. The Mercury News article he links to describes what is at stake as: "A three-judge 9th U.S. Circuit Court of Appeals panel appeared skeptical at times of the prosecution's arguments to overturn San Francisco U.S. District Judge Susan Illston, who in March excluded perhaps the government's best evidence on the eve of trial, including three positive steroid tests allegedly linked to the former San Francisco Giants slugger. But at least one of the 9th Circuit judges, Carlos Bea, also had some tough questions for Bonds' lawyer, Dennis Riordan." The U.S. Court of Appeals for the Ninth Circuit has made available for download the audio of today's oral argument via this link (4.76MB Windows Media audio file). appeals from an order denying his motion filed under Florida Rule of Criminal Procedure 3.851 seeking to vacate his judgment of conviction of first-degree murder and sentence of death...Hurst has raised several guilt phase postconviction claims and one penalty phase claim. He also contends that the cumulative effect of errors in the guilt and penalty phases deprived him of a fair trial. We turn first to the guilt phase claims. We reiterate the principle that not every capital defendant requires a mental evaluation, but where, as here, available information indicates that the defendant could have significant mental health problems, counsel will be deficient in failing to investigate the defendant‘s mental condition for purposes of mitigation. Because there was no reasonable, strategic reason not to present any mental mitigation during the penalty phase of Hurst‘s trial, and a reasonable investigation would have disclosed statutory and nonstatutory mitigation that could have shored up the otherwise weak mitigation, counsel was deficient in his performance under the first prong of Strickland. As the postconviction court found, after hearing the mental health experts‘ testimony at the evidentiary hearing, both statutory and nonstatutory mitigation is available for consideration that was not available during the penalty phase of Hurst‘s trial. There appears to be no countervailing "double-edged" sword to presentation of this mitigation—it did not indicate antisocial personality disorder or another unfavorable psychiatric condition and was not inconsistent with Hurst's "not guilty" posture. Because this mitigation was not made available for the jury or the trial judge to consider before the death sentence was imposed, our confidence in the imposition of the death penalty in this case is undermined. Accordingly, we must vacate the death sentence in this case and remand for a new penalty phase proceeding. In Infante v. Vantage Plus Corp., et al (3D08-1960), the Third District granted a motion for clarification. The original opinion, released on June 24, 2009, was discussed here. As with the original opinion, the court held that "We reverse because Infante correctly asserted all of the causes of action in her complaint, and thus, the trial court improperly vacated the default final judgment on the grounds that the complaint was technically deficient." “A default admits every cause of action that is sufficiently well-pled to properly invoke the jurisdiction of the court and to give due process notice to the party against whom relief is sought.” Bowman v. Kingsland Dev., Inc., 432 So. 2d 660, 662 (Fla. 5th DCA 1983). Furthermore, as we stated in Becerra v. Equity Imports, Inc., 551 So. 2d 486, 488 (Fla. 3d DCA 1989), a “judgment by default operates as a waiver of any mere formal errors in plaintiff’s pleading but does not cure a totally defective complaint or waive errors which go to the foundation of plaintiff’s cause of action.” (citing 49 C.J.S. Judgments § 200 at 356 (1947)). In Moynet v. Courtois, 8 So. 3d 377, 380 (Fla. 3d DCA 2009), we stated that plaintiff’s “failure to allege criminal intent is fatal to their cause of action for civil theft. Moreover, there are no other facts alleged from which criminal intent may be implied.” While the words “criminal intent” did not appear on the complaint, it is quite detailed in setting forth how the defendants conspired to defraud Infante of her money. We have never required the incantation of magic words, nor voided default judgments on the basis of mere technical errors in pleading. See, e.g., Lazcar Int’l., Inc. v. Caraballo, 957 So. 2d 1191, 1193 (Fla. 3d DCA 2007)." In City of Key West Tree Commission v. Havlicek (3D09-1595), the Third District reversed the trial court's review of a oral ruling by a magistrate judge because "The Magistrate should enter a written order, and without it, the circuit court has no jurisdiction." whether an employer who has a restrictive covenant with employees can recover its attorney’s fees from a third party who knowingly aids and abets the employees’ violation of the restrictive covenant. We hold that the employer cannot recover its attorney’s fees from the third party in that situation. The plaintiff below and two employees entered into confidentiality agreements containing a restrictive covenant stating that, for two years after the employees’ last date of employment, they would not compete with the plaintiff’s business. The employees later left the plaintiff’s business. Within a few months, the plaintiff’s owner received a phone call from a competitor, Denise Bauer, asking whether a non-compete agreement bound one of the employees. The plaintiff’s owner allegedly told Bauer that the employee was bound, although Bauer claimed that the owner refused to respond. In any event, Bauer hired the employees. The trial court entered an order awarding attorneys fees to the plaintiff and against the defendants - both the former employee and the former employee's new employer. To the extent the plaintiff sought to recover its attorney’s fees under section 542.335(1)(k), no such statutory authority exists against a third party like Bauer...“A court shall not enforce a restrictive covenant unless it is set forth in a writing signed by the person against whom enforcement is sought.” § 542.335(1)(a), Fla. Stat. (2007) (emphasis added). If a plaintiff cannot enforce a restrictive covenant against a person who did not sign it, then it follows that a plaintiff cannot recover its attorney’s fees from that person either. In their briefs, the parties have identified one decision which facially contains a contrary result. In Sun Group Enterprises, Inc. v. DeWitte, 890 So. 2d 410 (Fla. 5th DCA 2004), a plaintiff unsuccessfully sought to enforce a restrictive covenant against defecting employees and their subsequent employer. Id. at 412. The Fifth District granted appellate attorney’s fees under section 542.335(1)(k) to the employees and the subsequent employer, even though the subsequent employer did not sign the restrictive covenant. Id. The Fifth District did not provide any reasoning to support its decision or indicate whether the plaintiff contested the issue. We certify conflict with Sun Group. Reversed as to judgment for attorney’s fees against appellant. "I am advised by my co-counsel, Adele Shank, who is at the prison in Lucasville, that the execution team has been attempting since approximately 1 p.m. this afternoon to obtain IV access to a site in Mr. Broom's body in order for the lethal injections to be administered, but without any success. "It appears ... that these efforts have been going on now for almost two hours, and that the execution team members have evidently now taken a 'break,' " Sweeney wrote. Broom's execution was initially scheduled for 10 a.m. ET, but was delayed for legal reasons and rescheduled for Tuesday afternoon, Sweeney told CNN. "When such allegedly skilled professionals have taken this much time without successfully achieving IV access, there comes a point of diminishing returns, and a point when further attempts are cruel and counterproductive," Sweeney wrote to Moyer. "I believe we have reached that point here." On September 1, 2009, a panel of the Sixth Circuit denied Mr. Broom's challenge to the method of execution used in Ohio. That decision can be found here. On September 11, 2009, the Supreme Court of Ohio REVERSED the Ohio Court of Appeals [for the Supreme Court of Ohio opinion see here; for the Court of Appeals opinion see here] which stayed the execution. On July 30, 2009 "The court of appeals held that pursuant to two appellate decisions from 1994 and 1995 interpreting Steckman, Broom “was unavoidably prevented from discovery of the facts upon which petitioner must rely to present the claim for relief” in his earlier petitions." The Supreme Court of Ohio found the analysis by the court of appeals "unpersuasive" and reversed. Interestingly, Justice Pfeifer appears to disagree with Justice Scalia's recent dissent in In re Davis and stated in a concurring opinion that if Mr. Broom's claim had any merit he would remand to the trial court for hearings regardless of procedural defects. Justice O'Donnell dissented without opinion other than that he would have affirmed the court of appeals. On Monday a panel of the Sixth Circuit refused to stay the execution and the court declined to hear the case en banc [see an article here]. Also on Monday, the governor had denied Mr. Broom's request for clemency [see article here]. Yesterday, the United States Supreme Court denied Mr. Broom's Petition for Certiorari and Application for Stay [see here] and today, the Court denied his Petition for Rehearing [see here]. In two other petitions filed by Mr. Broom, Justice Stevens denied applications for stay today. Richard Dieter, director of the nonprofit Death Penalty Information Center, said he knows of only one inmate who was subjected to more than one execution attempt. A first attempt to execute Willie Francis by electrocution in Louisiana did not work, and he was returned to death row for nearly a year while the U.S. Supreme Court considered whether a second electrocution would be unconstitutional. He said he expects legal challenges will mean Broom will not face execution again in a week's time. "I think this is going to be challenged, whether under our standards of decency subjecting someone to multiple executions is cruel and unusual ... whether this is in effect experimenting on human beings, whether or not they're sure what works in Ohio," he said. Finally, on March 17, 2006, the Sixth Circuit denied Mr. Broom's habeas petition. That decision can be found here. A 2002 Ohio Court of Appeals decision relating to a writ of prohibition petition filed by Mr. Broom can be found here. Google has a new service called Google Fast Flip, and Business Week has an article about it here. It looks interesting. The article states: "Google Inc. is testing a new format that is supposed to make reading online stories as easy as flipping through a magazine, a shift that eventually could feed more advertising sales to revenue-starved publishers." Retired Supreme Court Justice Sandra Day O'Connor spoke out against judicial elections in this AP article. "She told a sold-out audience that threats to judicial independence are rising exponentially as more and more money pours into judicial races around the country." Jeffrey Toobin wrote this article titled "Bench Press: Are Obama’s judges really liberals?" Jeffrey Rosen has this op-ed in the New York Times titled "The Trial of John Roberts." Boston's The Gourmet Pizza must pay for lap-band surgery for Adam Childers, a cook at the store in Schererville, under last month's Indiana ruling that upheld a 4-3 decision by the state's workers' compensation board. Childers, who was then 25, weighed 340 pounds in March 2007 when he was accidentally struck in the back by a freezer door. Doctors said he needed surgery to ease his severe pain, but that the operation would do him no good unless he first had surgery to reduce his weight, which rose to 380 pounds after the accident. We emphasize that the sole question before us is whether the gastric bypass surgery was "directed to" claimant's current arthritic knee condition, which was caused in major part by his compensable 1976 injury. ORS 656.245(1)(a) does not limit the compensability of medical services simply because those services also provide incidental benefits or help to treat other medical conditions that were not caused by the compensable injury. The fact that the gastric bypass also treated claimant's morbid obesity as a necessary incident of effectively treating his knee condition does not affect the resolution of the compensability of his medical services claim. Because the gastric bypass was "directed to" claimant's current arthritic knee condition, we need not express an opinion as to the classification or cause of claimant's morbid obesity. It is not relevant to the issue before us. Two Appeals Dismissed Sua Sponte - Order Below Never "Rendered"
We also have concerns about the summary disposition of U.S. Bank’s motions. We are mindful of the significant workload faced by Florida’s trial judges, particularly with the flood of foreclosures inundating the court system and the staff reductions necessitated by budget shortfalls. Nonetheless, for an appellate court to provide meaningful review of a trial court order, particularly when the trial court possesses significant discretion, some indication of the reasons underlying the trial court’s ruling is helpful. “It is not the function of an appellate court to cull the underlying record in an effort to locate findings and underlying reasons which would support the order.” Jacques v. Jacques, 609 So. 2d 74, 75 (Fla. 1st DCA 1992). Here, the trial court’s “denied” stamp does not help us determine if the trial judge abused his discretion or not. Some basis for the ruling would be instructive both to the parties and this Court. This is not a new story, however, just came to my attention from an article published by the BC Heights today. The story indicates that "Last March 30, the Boston College Police Department (BCPD) entered Riccardo Calixte's, BC '09, dorm room and seized an iPod Touch, a disassembled Blackberry cell phone, a Dell Inspiron, a MacBook laptop, and other computer-related devices." The Massachusetts Supreme Judicial Court has since quashed the search [see here]. In January of 2009, soon after Riccardo Calixte and his (now ex) roommate suffered “domestic issues,” the roommate made certain allegations to Boston College Detective Kevin Christopher, including that Calixte had “hack[ed] into the B.C. grading system . . . to change grades for students” and had “a cache of approximately 200+ illegally downloaded movies as well as music from the internet.” On March 30, Detective Christopher applied for, and was granted, a search warrant to seize Calixte’s computers, electronic devices, and digital storage devices. In his application for the warrant, Christopher also alleged that Calixte was the author of a mass email to the Boston College community that “outed” his ex-roommate as gay and included a link to a profile on a gay online-dating site created in his ex-roommate’s name. You can also visit the Citizen Media Law Project database entry here, which provides an extensive summary of the case. After the seizure, Calixte teamed with the Electronic Frontier Foundation and Fish & Richardson - who took the case pro bono. After the trial court denied a motion to quash the search warrant, Justice Margot Botsford of the Massachusetts Supreme Judicial Court reversed the decision and quashed the warrant. The decision from Massachusett's High Court can be found here. The Court found that the search and seizure was unlawful because the affidavit failed to establish probable cause that a crime had been committed, or that evidence of a crime existed in Mr. Calixte's computer equipment. The affidavit failed to establish that any grades had been hacked by anyone, much less by Mr. Calixte. Although the affidavit contained an unsubstantiated report from an alleged eyewitness (the former suite mate), the affidavit failed to explain when the alleged incident occurred, where it occurred, and how (and with what equipment) it was accomplished. These are all facts that any actual eyewitness would have been able to supply. Moreover, the affidavit also lacked evidence that the police ever tried to confirm with the College's computer administrators and professors that such a breach had occurred before searching Mr. Calixte's room. The Court also rejected the Commonwealth's theory that spreading rumors by email could constitute the crime of unauthorized access to a computer system. To the contrary, the Court noted that such a reading of the statute would "dramatically expand [the law's] appropriate scope." "This case establishes two important legal principles at the intersection of criminal law and computer technology," said Larry Kolodney, a principal in Fish & Richardson's Boston office and chair of the firm's pro bono committee who served as lead counsel in the case. "First, it clearly rejects the concept, which has found some support in other jurisdictions, that violating the fine print of a computer use policy is a crime. This is an important decision that should serve as a bulwark against similar efforts at prosecutorial overreaching in the online world. In addition, the case provides important safeguards against arbitrary searches of computers and other digital devices - devices that often contain our most private information - based merely on the flimsy accusations of someone with an axe to grind."